In the 12 day tour of India with Kathmandu-Nepal, you are arriving by flight into Delhi and also are departing from Delhi. The India & Kathmandu tour is quite a famous tour for the first timers to the Indian sub-continent. The India tour with Kathmandu is a culinary delight with the Indian Mughlai food, the Nepalese food and the Rajasthani food. This tour is actually a Golden Triangle with Kathamnaudu tour and also includes Varanasi which is the high-light. 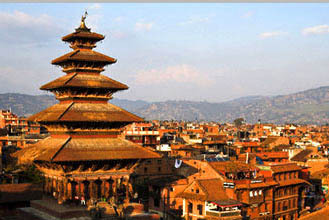 Services International Lufthansa City Center offers you various India and Kathmandu tour packages! Morning transfer to airport for Kathmandu flight. Arrive & transfer to Hotel. Overnight Kathmandu. Morning visit the Durbar Square, Hanuman Dhoka, the ancient royal residential quarter, Mahadev and Parvati Temple and other temples. Afternoon free. Overnight Kathmandu. Day 05 :- Kathmandu - Varanasi (Banaras) Transfer to airport for Varanasi flight. Arrive Varanasi & transfer to Hotel. Overnight Varanasi. Early morning boat excursion on the river Ganges, a ferry pilgrimage from ghat to ghat. People bathe early in the morning to offer the prayers to the rising sun. The two cremation ghats are Manikarnika & Harishchandra where funeral pyre burns Day and night. Every pious Hindu believes that to die in Kashi and to be cremated on banks of the Ganges is to attain release from the cycle of birth and death. Rest of the leisure. Overnight Varanasi. Day free. Check-out at 1200 hrs. Evening transfer to rail station for Tundla (Agra) night train. Night on board. Morning arrive Agra and transfer to Hotel. Afternoon visit the world famous Taj Mahal built by the Moghul Emperor Shahjehan in 1630 for his Queen Mumtaz Mahal to enshrine her mortal remains. Later visit the Agra Fort containing the Halls of Public and Private Audience. Taj Mahal is closed on FriDays. Overnight Agra. Drive to Jaipur visiting Fatehpur Sikri enroute. Fatehpur Sikri is 40 kms from Agra and built by Emperor Akbar in 1569 and abandoned after 15 years due to scarcity of water. See the graceful buildings including the Jama Masjid, Tomb of Salim Chisti, Panch Mahal and other Palaces. Afternoon free. Overnight Jaipur. Morning visit Amber Fort. Amber Fort was the ancient capital of the State. Visit the Sheesh Mahal or the Hall of Victory glittering with mirrors. Afternoon tour of Jaipur. Jaipur - the capital of Rajasthan was given a colour coat of pink a century ago in honour of a visiting Prince and ever since, it has retained this colour. Built by Maharaja Jai Singh, the notable astronomer, this city is 260 years old. Visit Maharaja's City Palace, the Observatory. Drive past Hawa Mahal & through the pink rose residential & business areas. Overnight Jaipur.